Continuity mistake: When Charlie and Louis are on the plane to Australia, and Louis gives the candy to Charlie, Charlie's hair is untidy in the back, but when he's eating the candy, his hair is flat. Revealing mistake: Any time that Charlie is kicked by the kangaroo, they show him falling back onto the ground. But, if you look closely, they just used the same shot over and over. The exact same two lines in the dirt are to his left by his head each time. Continuity mistake: In the scene where Jessie shows up in the desert to rescue Charlie and Lewis, she is riding on one camel, when they leave in the morning there are three. Where did the other two camels come from? Continuity mistake: When Charlie is about to jump in the lake with Jesse, Charlie still has the anti-scent make-up on. In the next shot, it's no longer there, and in the shot after that, it's there again. Finally, when Charlie jumps in, without any scrubbing, the make-up's gone for good. Continuity mistake: Waffles the dog is mentioned as a boy in the van, but is mentioned as a girl at the warehouse. Continuity mistake: When Louis and Charlie are on the plane, Louis finds the money and knocks on the bathroom door 2 times. The first time, you see his hand move and hit the door. The second time you can see that neither of his hands move. Revealing mistake: In the last scene, when Louis jumps into the hot tub, he jumps from about 12-15 feet back. Besides the fact that no one of his size should be able to jump that far, he falls into the water nearly vertically. Jumping from that far away should make him fall in at a sharp angle. Continuity mistake: This mistake happens in the plane scene. At the start, the plane says "Dingo IV". But when they crash, the I and the V look different. Revealing mistake: There is a scene where the main characters are chasing the kangaroo through the outback. In one close-up shot where their vehicle becomes airborne, you can see that the wheels are not spinning. Continuity mistake: Throughout the movie, Waffles, Louis' dog, changes from a long-haired dog to a short-haired dog. Factual error: Near the end of the movie, in the scene on the cliff, Charlie, Jessie and Louis are saved from impending murder when Senior Sergeant Jimmy appears, flying up in a helicopter and announcing he is from Australian Police. There is no police department in Australia called "Australian Police" - police departments in Australia are named after the state they are based in. As they are apparently near Alice Springs, Jimmy should have yelled out that he was from "Northern Territory Police." Continuity mistake: In the chase scene, when Charlie and Louis go through the termite mounds, you can see that they are fake. Watch really closely and you'll see them hit one that doesn't break it just bobs back and forth. Continuity mistake: When Louis washes his face at the camel fountain, he splashes water on his face. In the next shot his face is bone dry. Louis Booker: Don't worry, Charlie. We'll get the money back, all right? He can't go far. Charlie Carbone: It's a continent, Louis. He can go very far. Louis Booker: I know it's a continent. I read the book. Charlie Carbone: Did you happen to read the chapter on not putting your jacket on a wild animal? Louis Booker: No, but I did read the chapter on how an aborigine can kill a white man with a twig. Do you want to see that one? Originally, the story was very different. 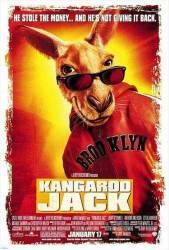 The kangaroo appeared only in one scene, but the crew liked it so much, they changed the whole movie.